Everybody knows about Jack the Ripper but there have – regrettably – been other men who have attacked women in the metropolis. And they had equal notoriety. One such was the London Monster. He didn’t actually murder women, unlike the Ripper, but slashed at them in the face or backside. The knives or daggers were reputedly strapped to his knees – as the illustration shows – or concealed in other ways to take his victims by surprise. The London Monster at work – note knives attached to his knees! Most of the women he attacked seemed to have been ladies of substance – unlike the prostitutes targeted by Jack the Ripper. And he appears to have suffered from some psychopathic condition that necessitated this curious lashing out. 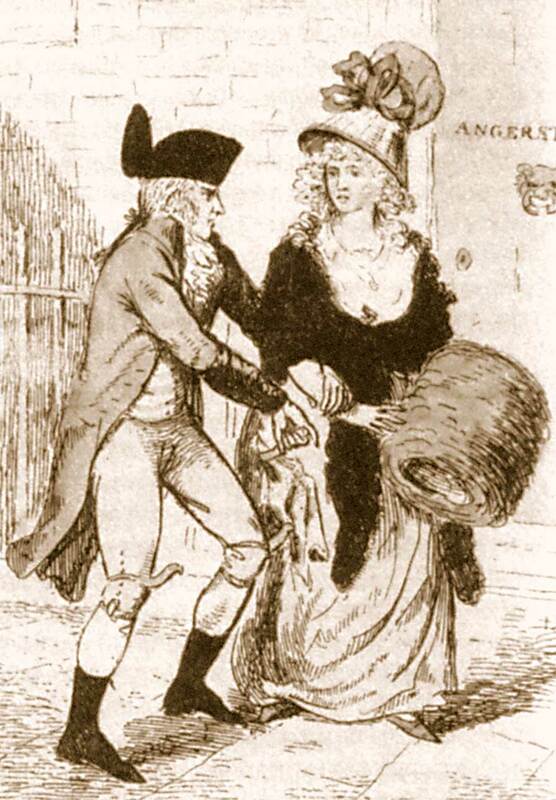 Eventually, a man, Rhynwick Williams, was apprehended after allegedly attacking a spinster called Ann Porter. It seems to have been his intention to rip at her clothes more than the person inside them. RENWICK WILLIAMS , was indicted, for that he, on the 18th of January last, with force and arms, at the parish of St. James, Westminster, in the king’s highway, in a certain public street there, called St. James’s-street , unlawfully, wilfully, maliciously, and feloniously, did make an assault on Ann Porter , spinster , with an intent to tear, spoil, cut, and deface her garments and clothes; and on the same day, with force and arms, in the same public street, wilfully, maliciously, and feloniously, did tear, spoil, cut, and deface her garments: to wit, one silk gown, value 20 s. a pair of stays, value 5 s. a silk petticoat, value 5 s. one other petticoat, value 5 s. a linen petticoat, value 5 s. and a shift, value 5 s. her property, part of her apparel which she had on her person, against the form of the statute, and against the king’s peace, &c.
It is an unpleasant task to call your minds to a scene so new in the annals of mankind; a scene so unaccountable: a scene so unnatural to the honour of human nature, that it could not have been believed ever to have existed, unless it had been demonstrated by that proof which the senses cannot resist: but while we are trying the prisoner at the bar, for this unnatural, unaccountable, and until now, unknown offence, we should not forget that he is our fellow being, and give him an attentive hearing. The attacks, the prosecution railed, had been against women who were “the most beautiful! the most innocent! the most lovely!” But what puzzled the court was that William didn’t seem to be after their money or any riches. His attack on Ann Porter had occurred as she returned from a ball in St James’s, Westminster. Unfortunately for Williams, having torn at her clothes, he then paused to stare at her. As a result, his face was etched on her mind. A little later, she spotted Williams in St James’s Park and a male friend chased him to his dwellings. From there he was arrested and put on trial. Only some historians cast doubt on whether Williams was the London Monster or indeed if such a person even existed. Was it an example of a kind of urban hysteria? Was Ann Porter leaping on the bandwagon of other reported attacks? Or was Williams just mistakenly identified? Whatever the truth – he got six years in prison.